Chef Linton and Gina Hopkins (Restaurant Eugene, Holeman & Finch Public House) will open C. Ellet's, a modern take on the classic American steakhouse. C. Ellet's, 2605 Circle 75 Pkwy., Ste. 400, Atlanta, GA 30339, no phone. The Otherside Steakhouse at Uncorked on Main adds Southern touches to the steakhouse experience. While steaks are a focus, appealing chicken, salmon and a shrimp-and-grits dish vary the options. The Otherside Steakhouse at Uncorked on Main, 129B Main St., Villa Rica, GA 30180, 678-941-3699. Food Terminal presents Malaysian fare in a bright, intelligently designed space in Chamblee. Noodles are a signature item, but you'll also encounter five-spice seasoned pork belly with tofu and soft-boiled egg cooked in soy sauce; watercress prepared with black bean sauce; and mango sticky rice for dessert. Food Terminal, 5000 Buford Hwy. NE, Ste. B201, Chamblee, GA 30341, 678-353-6110. Nexto will serve as a private events space for the summer. The restaurant is expected to start regular meal service again in Fall 2017. Nexto, 828 Ralph McGill Blvd. NE, Atlanta, GA 30306, 404-809-3763. The Café and Lobby Lounge at The Ritz-Carlton, Buckhead are closed for renovations. A new food and beverage concept is expected to debut in late Fall 2017. The Café, The Ritz-Carlton, Buckhead, 3434 Peachtree Rd. NE, Atlanta, GA 30326, 404-237-2700. 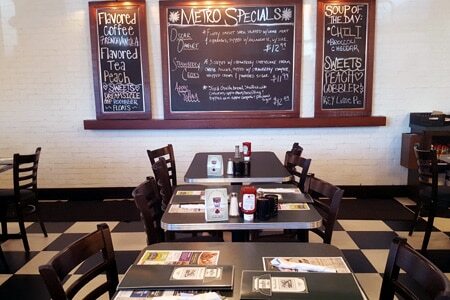 Florida-based chain Metro Diner closed its location in the metro Atlanta area. Metro Diner, 880 Holcomb Bridge Rd., Ste. 100, Roswell, GA 30076, no phone.